During the middle of the Chicago Marathon, Stephanie Reinhart and Mark Jockel got married at the 8-mile mark on October 11. This gives “running away to get married” a whole new meaning! Stephanie Reinhart and Mark Jockel married just steps from the 8-mile mark during the Chicago Marathon on Sunday, October 11. When the bride and groom’s wedding ideas became drastically different, they found an unusual compromise in the Chicago Marathon. Reinhart, 35, wanted a no-frills ceremony at city hall, while Jockel, 46, dreamt of a large ceremony with all their family and friends in attendance. During the Bank of America Chicago Marathon, just a few feet from the 8-mile mark, a white garden arch was raised and the two were married. The entire ceremony, under the race medal-laden archway, lasted under under four minutes. The newlyweds kissed, toasted with Gatorade, and continued running. “We wanted it to be short because we knew we’d want to take some photos and then we had 18 more miles to run,” Reinhart said. Reinhart wore a white running top and skirt and held a bouquet of fall colored flowers, while Jockel was dressed in black shorts and a tuxedo t-shirt. The two were married by one of Reinhart’s high school track teammates who became ordained online just so she could participate – running bib and all. 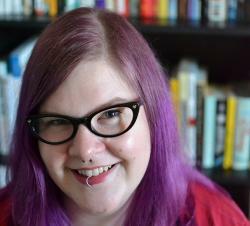 “It took me a day or two to come around to the idea,” Jockel said. “But everyone I talked to about it was like, ‘That’s the most incredible thing I’ve ever heard. You’ve got to do it.’” So they did. “We invited guests from all over – Washington state, Colorado, out east – and everybody made it. No one turned us down,” Jockel told the Tribune. The couple met through the Chicago Area Runners Association two years ago, where they both trained in the 8-minute mile marathon-running group. Their wedding race was Jockel’s ninth marathon and Reinhart’s third. 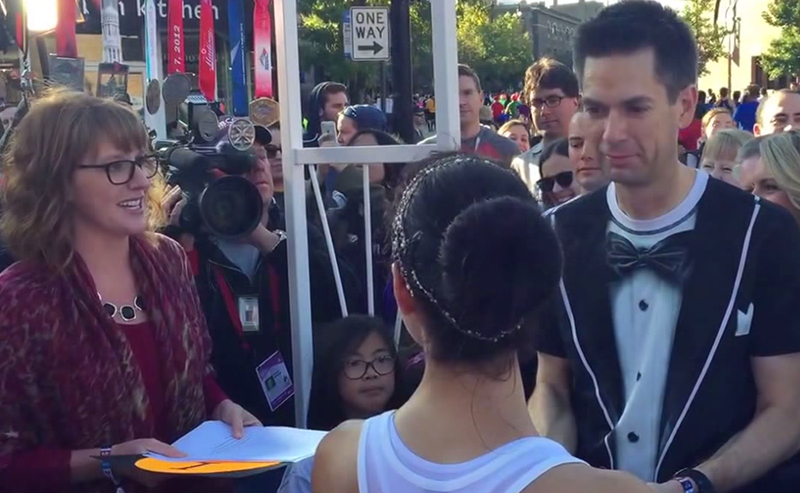 Though the Chicago Marathon officials were not involved in the bride and groom’s wedding planning, they did offer a wedding gift to the couple after the race. The newlyweds were given commemorative bride and groom race bibs, which they happily wore. With a honeymoon to top their marathon wedding, the couple will be traveling to Canada’s Churchill, Manitoba, to engage in a polar bear trek. Be the first to comment on "Runners Marry at Mile 8 During Chicago Marathon"